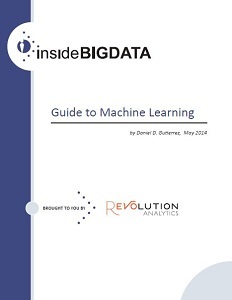 I’ve been contracted to research, develop and write a new technology guide “insideBIGDATA Guide to Machine Learning” sponsored by Revolution Analytics. The technology guide will present an overview of using R for data science projects that include machine learning elements. Watch for the guide in May 2014. UPDATE! 5/13/2014 – My new machine learning guide was launched today. You can download it HERE. Enjoy!